[twitter]When you have young children, taking a quick daytrip is a great way to spend half a day exploring. You’re on the road for less than an hour, you do some walking around, you stop for a snack and .. voila .. they fall asleep on the ride home after a few hours of fresh air and adventure. 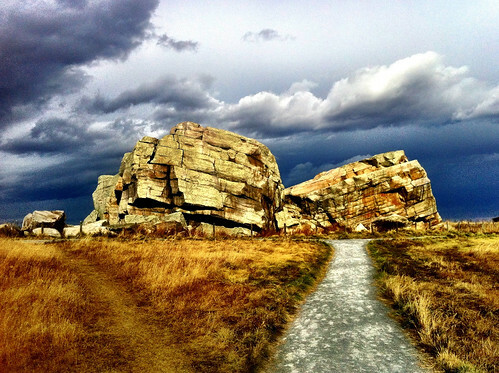 50km southwest of Calgary is where you’ll find the world’s largest glacial erratic. 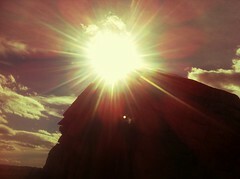 A big rock. In the middle of nowhere. 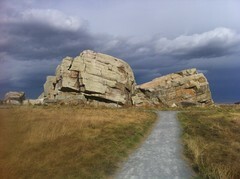 An okatok, to use the Blackfoot word for rock. 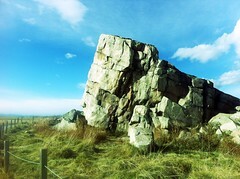 The erratic is easy to find, it’s 10km west of the town of Okotoks, Alberta on Highway 7 on the north side of the road. Signs point the way to the parking lot and the hundred metre stroll to the big rock. 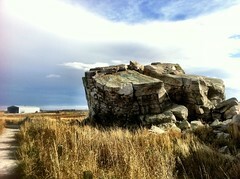 So, how did this big rock end up in the middle of the prairies? The enormous quartzite block, weighing around 16 500 tonnes, was carried on a glacier. Originally a piece of the Rocky Mountains near Jasper some 18 000 years ago, the big rock was borne on a slow journey as the glacier flowed east and south under geological forces. When the ice age ended some 10,000 years back, a string of erratics was deposited along the foothills, with Big Rock the largest. 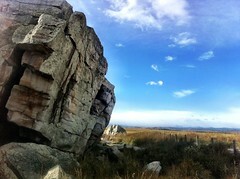 So that’s the story of how the rock got there and how the town of Okotoks got its name, but it doesn’t end there. There’s a brewery named after big rock too – Big Rock Brewery. In an industry filled with names that reflect Teutonic traditions, alpine splendor, or brave woodland predators, our company is named after a multi-tonne granite glacial deposit located outside of Okotoks, Alberta. 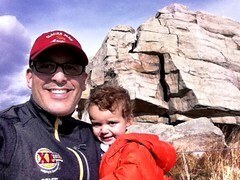 This big rock in the middle of the prairie is known as an erratic, we think it fits.